This show was broadcast January 1, 2015. 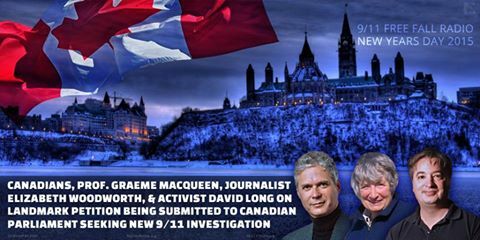 Activist David Long, journalist Elizabeth Woodworth, and retired professor Graeme MacQueen discuss the landmark petition that is being submitted to the Canadian parliament seeking a new investigation into 9/11, and how recent revelations about the activities of the U.S. government during the “War on Terror” further justify the need for governments around the world to doubt the official story they’ve been given. This entry was posted on Thursday, January 1st, 2015 at 2:05 am	and is filed under 9/11, 911 Free Fall, Censorship-Propaganda, False Flag/Fake Terror, Freedom, Justice, Protest, Science. You can follow any responses to this entry through the RSS 2.0 feed.